Cut all the vegetables in the same length, about 1 – 1 1/2 “ pieces. 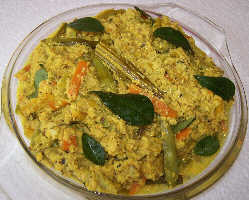 Grind together grated coconut, cumin seeds, small onions, green chillies and curry leaves into a coarse form. When the vegs are cooked, add the raw mango pieces and cook with the vessel open. Allow all the water to get evaporated. When done, add the coconut oil and curry leaves and mix well. Remove from flame and cover the vessel with a lid.